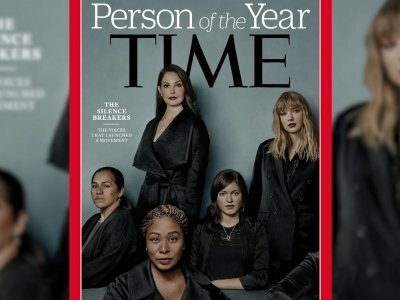 NEW YORK (AP) — The “Silence Breakers” — those who have shared their stories about sexual assault and harassment — have been named Time magazine’s Person of the Year. Numerous women have spoken out publicly since October about sexual misconduct by dozens of high-profile men in entertainment, media, business and sports. Time praised those who have given “voice to open secrets, for moving whisper networks onto social networks, for pushing us all to stop accepting the unacceptable.” The magazine’s cover features Ashley Judd, Taylor Swift, Susan Fowler and others who say they have been harassed. The tweets, Instagram and Facebook posts began after actress-activist Alyssa Milano followed on a suggestion from a friend of a friend on Facebook and tweeted: “If you’ve been sexually harassed or assaulted write ‘me too’ as a reply to this tweet.” The hashtag was tweeted nearly a million times in 48 hours. #MeToo was actually founded by activist Tarana Burke a decade ago to raise awareness about sexual violence. Milano has said she wasn’t aware of Burke’s contributions when she made her initial tweet and has since publicly credited her. Wednesday’s winner differed slightly from how it was described the shortlist of finalists, which mentioned only the #MeToo movement. Time has made such changes before. The 2014 winner, “The Ebola Fighters,” was listed as “Ebola Caregivers” in the shortlist. The two runners-up for Person of the Year were Chinese President Xi Jinping and President Donald Trump, himself accused of sexual misconduct by numerous women. He has denied any wrongdoing. Trump, Person of the Year in 2016, tweeted recently that the magazine had told him he “probably” would be named again if he agreed to an interview and photo shoot. Trump added that he “took a pass.” Time has disputed his account. This story has been corrected to show that Time magazine’s Person of the Year is the silence breakers. The #MeToo movement is a part of that group.